I was beyond excited for this meal. I made the reservation 4 weeks in advance, and my friends and I arrived at the restaurant at 1pm on Good Friday. We walked into the grand dining room where soft music was being played by an old pianist in the back of the restaurant. 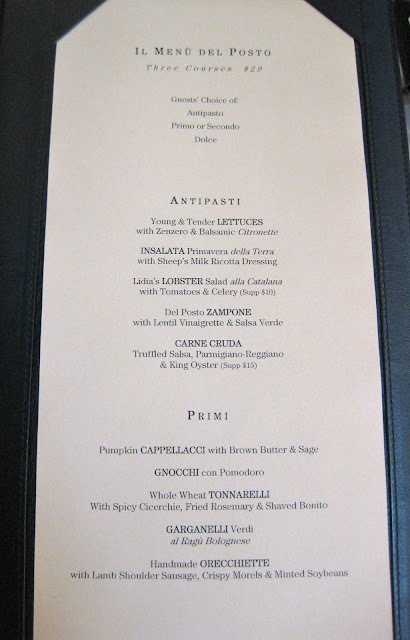 The food was an exciting experience of different flavors, and the server was helpful and not snobby in the slightest. Leather-bound Coach brand menu. (My friend told me to make sure I include the fact that it's Coach haha). The bread was so fresh and warm! 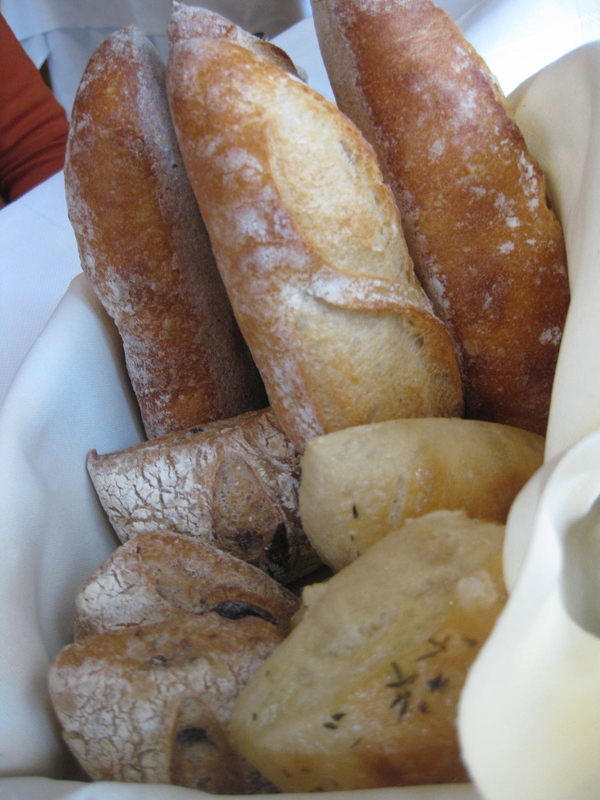 There were 3 kinds in the basket-- French, olive, and rosemary. 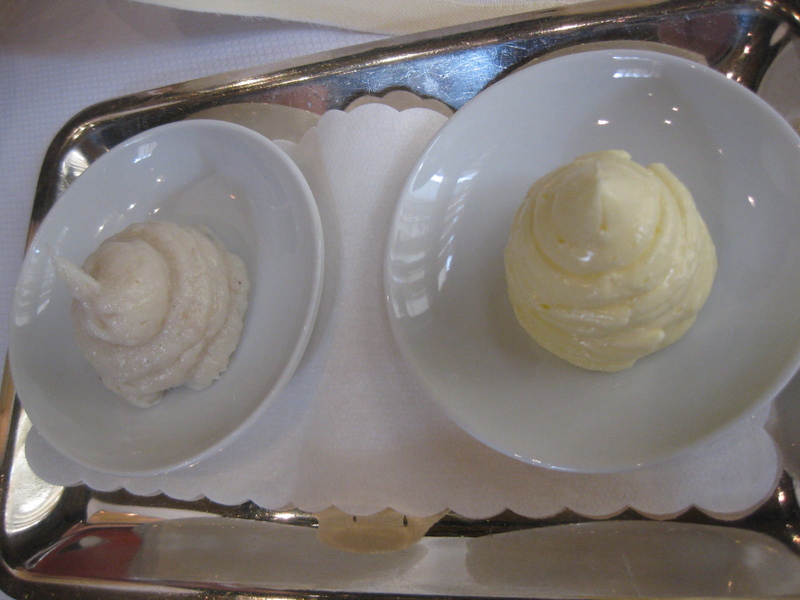 On the right is butter, on the left is lard. Yes, lard. The server explained that it consists of whipped pork fat with salt and rosemary. It was slightly saltier than the butter. Amuse Bouche. From bottom left going clockwise: mortadella with sesame puff, straciatella, Roman egg drop soup, and finally saffron rice balls. This salad was made from lettuce grown in Del Posto's own garden. The leaves were so fresh and crisp. The dressing was ginger and balsamic citronette-- a great combination of flavors, but it felt too much like a diet plate (not enough substance). Del Posto Zampone with lentil vinaigrette and salsa verde. Cacciucco diver scallop carpaccio and garlic bread soup. A light wonderful soup base topped with more than enough shrimp, scallops, and fish. Seared duck breast. This is one of Del Posto's most popular dishes. 3 of my friends ordered this and after I took a bite I wished I had too. The duck was slightly crispy on the outside but still tender on the inside. Tartufo with dark chocolate. Once the fork broke into the thin dark chocolate shell, a very strong espresso ice cream was revealed. Chocolate Ricotta Tortino with olive oil gelato. This was my favorite dessert, it tasted like a rich chocolate cheesecake! The olive oil gelato didn't have as strong an olive oil flavor as I hoped it would though. Warm Plum Macedonia with crushed chestnuts and yogurt gelato. Incredible. Butterscotch Semifreddo melon agrumatta. Beautifully plated. Petit fours placed on a cheese grater. From the left, chocolate covered olive oil gelato lollipops, mini doughnuts filled with vanilla orange cream, dried grapefruit, and dried blackberry. The grapefruit was surprisingly sweet and chewy. The meal took longer than expected. We sat down at 1:00pm and finished at 3:30pm. The wait time between courses was around 20 minutes. Probably not the best lunch place to visit if you've got a restricted lunch hour. A very annoying thing that happened after this meal was when I checked my credit card bill a few days later I found that the restaurant added a $10 tip to my bill that I had not authorized. It took me 3 phone calls for the restaurant to finally reverse that charge, but the worst thing about it was the manager refused to call me back or come to the phone whenever I called. I was therefore put on hold each time and the hostess would go and relay the message to the manager, then come back and tell me what he'd said. Really unprofessional and surprising. An extra tip has never, ever been added to my bill, and I can't believe the first place that did it was a restaurant as upscale as Del Posto. Very disappointing.